What happens when you’re a “corporate refugee” and your mantra is “best idea wins”? Two things! 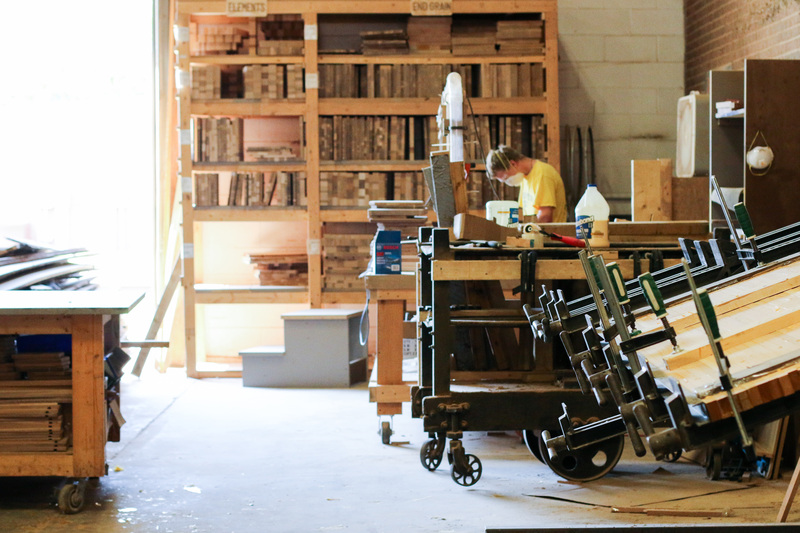 You leave the corporate world behind, follow your dream....and open a custom wood-working shop in downtown Holland that focuses on using rescued and reclaimed materials. Meet Ed De Nave and Randy Beute, contemporaries (and visionaries), who worked together in the automotive industry. Ed jumped ship first, in 2012, to combine his love of woodworking with his desire to grow something completely from scratch and create products that people could pass on to their children, much as Ed’s grandfather passed on not only his love of woodworking, but his well-worn tools of the trade, to Ed each Christmas...Randy came on board as a partner in 2015; his father was a small business owner for 40+years, and instilled in Randy the love of a small shop culture and the importance of interaction and collaboration with both customers and employees. Their product line is extensive: cutting boards, serving trays, signs, butcher block center islands, tables, benches, desks, credenzas, countertops, chess boards, pens and wall art, all handcrafted from hardwoods that would otherwise end up in the landfill. For a one-of-a-kind shopping experience, and a trip back in time, you’ll definitely want to visit Cento Anni at 136 East 6th Street.